To organize and conduct fishing clinics, promote angler education, fostering the knowledge and skills of fishing while reinforcing the importance of stewardship and outdoor ethics. Fin Addict Angler Foundation, a 501c3 non profit organization has dedicated its services from providing free group fishing classes to youth angler sponsorship programs. We are proud to have an opportunity of service to those who have never fished and to those whom through determination, enjoy the challenges of the outdoor life. Our services are to educate the importance of protecting and conserving our natural resources. We are excited about the Fin Addict Angler adventures. We sincerely hope you will join us in the next life chapters of the Fin Addict Angler Foundation. 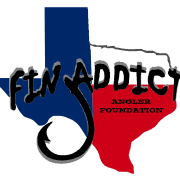 FIN ADDICT ANGLER FOUNDATION accepts donations. Donate Now. Would you recommend FIN ADDICT ANGLER FOUNDATION?